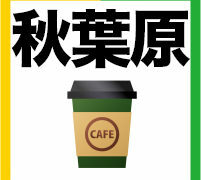 A list of cozy cafés where you can stay long in Akihabara area *No waitresses dressed in maid costume. Akihabara is now one of the hottest tourist cities. While 42 million passengers come and go a day on average, it is difficult to find out a café to take a break at. So I would like to introduce nice cafés in Akihabara area for study, work with your laptop, battery charge and chat with your friends. *A shopping mall atre2 is just next to Yodobashi-Camera, a major electronics retail store. I visited it on Sunday 7pm. It was not that busy and I worked with my PC without any problem. The ratio of studying alone to chatting with friends is 50 to 50. Good place to meet up with your friends. The location is a little odd like a ninja house, but what a crowd of people here! *atre1 is directly connected to Akihabara station. You can see the shop from the platform of JR Sobu line. You can order on the 3rd floor of atre1. They have about 10 seats on the 3rd floor, but you will find 68 seats on the 4th floor after walking up the spiral stairs inside the shop. Wow, so many people in a place like a secret room! アトレ1の4階スタバ＝総武線ホームと同じ高さなのだな。忍者部屋みたい。The 4th floor is at the same level as the platform of JR Sobu line. It is like a ninja house. The ratio of studying alone to chatting with friends is 70 to 30. The number of seats with battery charge is about 40. The shop itself is pretty big but the space between the seats is narrow. *It was fully occupied at 18:00 on Sunday, December. The ratio of studying alone to chatting with friends is 20 to 80. The space between the seats is narrow, but the terrace is open and comfortable to stay long. アキヨド7Fの有隣堂ブックカフェが凄く良いA book café on the 7F of Yodobashi-Camera Akihabara is really nice.